The company has achieved good scale (2009 revenues of $157M) but growth has been decelerating from 82% in 2007 to 47% in 2008 to 33% in 2009. Gross margins are high at 89% due largely to normal margins on license (96%), unusually high margins on support (96%), normal margins on consulting (27%), and a fairly small consulting business (10% of total revenues) which reduces the pull-down effect on the weighted average. Wall Street will like this. Sales and marketing expense is high at 59% of sales. Provided switching costs are high, you can argue this is a good investment, and provided growth is high, you can justify it. I’m going to assume they make some “lost year” arguments about 2009 in their story and will guide to re-accelerated growth, but I’m not sure. If not, then they will get pressure about the inefficiency of their sales model. R&D is spectacularly low at 6% of sales. There is an argument that if you have a largely completed (cheap and cheerful) BI tool that you should simply go sell the heck out of it and not artificially spend money in R&D when you have neither the vision nor the immediate need to either create new products or investment big money in enhancing your existing one. I’ve just seen few companies try to make it. I suspect Wall St. will pressure them to increase this number, regardless of whether it’s the strategically right thing to do for the company. Expanded customer base from 1,500 customers in 2005 to over 13,000 in 2009. I like their argument that because it’s easier to use than traditional BI tools that it should get greater penetration than the average 28% of potential BI users cited by IDC. The unique business model (free downloads and 30-day guarantee post purchase) are consistent with the cheap and cheerful product positioning, which is good. It does beg the question why sales costs so much, however, if you’re primarily upselling downloaders in a low-commitment fashion. I think the claim “analysis tools are not designed for business users” is over-stated. I can assure you that at BusinessObjects we were designing products for business users. I dislike the small piece of huge pie argument, but I suppose that particular fallacy is so embedded in human nature that it will never go away. I’d rather hear that QlikTech thinks its 2010 potential market is $400M and it wants 50% than hear – as it says in the prospectus — that they think it’s $8.6B and they presumably want somewhere around 2%. They expect 63M shares outstanding after the offering, implying that if they want a $10-$15 share price that they think the company can justify a market cap in the $750M to $1B range. If it were generating more than a 4% return on sales and growing faster than 33% that would be easier to assume. 50% of 2009 license and FYM came from indirect channels. This again begs the question why sales cost so much; indirect channels are, in theory, more cost-effective than direct. They had 124 “dedicated direct sales professionals” as of 12/31/09, which suggests to me that at an average productivity of $1.8M (including all ramping and turnover effects) they could do $223M in revenues in 2010, or growth in the 40% range. So they seem well teed-up from a sales hiring perspective. If my US readers are wondering why you’ve not heard of them, it’s because they were originally founded in Sweden and do 77% of revenues “internationally” (which now means outside the US given that they moved their headquarters in 2004). This relative lack of US presence should presumably hurt the stock. They have a pretty traditional enterprise software business model: perpetual license and maintenance. They even state potential demand for SaaS BI as a risk factor. 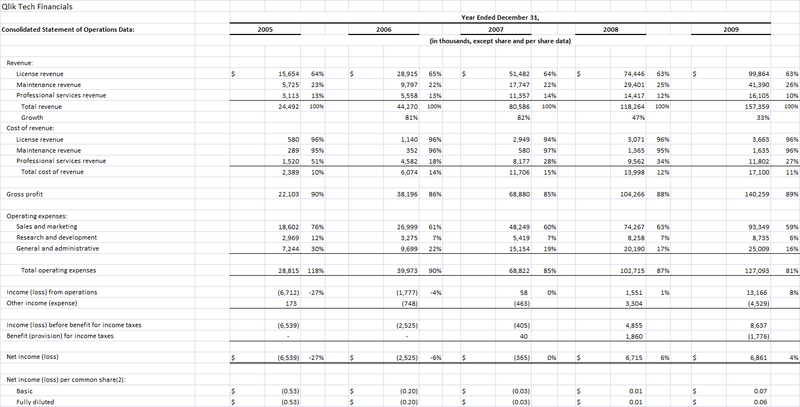 They had $35M in deferred revenue on the balance sheet as of 12/31/09. This strikes me as high; some quick back-of-the-envelope calculations led me to expect ~$25M if it was all the undelivered portion of pre-paid, single-year maintenance contracts. Per IDC, 44% of QlikView customers deploy within a month and 77% deploy within three months. It sounds impressive and is consistent with the small consulting business. But it also depends on the definition of deploy. This is no overnight success story; the company was founded in Sweden in 1993. There was a six-year product development phase (which perhaps explains the low R&D today) from 1993 to 1999. From 1999 to 2004 they sold almost exclusively in Europe. From 2004, they added USA sales and relocated the HQ to Pennsylvania. They intend to increase R&D expenses to increase in both absolute dollars and as a percent of sales going forward. 73% of revenues are not dollar denominated. This means that foreign exchange rates should hit them more (both ways) than for a typical software company. Our quarterly results reflect seasonality in the sale of our products and services. Historically, a pattern of increased license sales in the fourth quarter has positively impacted sales activity in that period which can make it difficult to achieve sequential revenue growth in the first quarter. Similarly, our gross margins and operating income have been affected by these historical trends because the majority of our expenses are relatively fixed in the near-term. USA revenues grew at 28% in 2009, a bit slower than company overall. Fairly surprising, given the late USA start and the presumably huge market opportunity. R&D remains in Lund, Sweden with 54 staff as of 12/31/09. 574 total employees as of 12/31/09 with 148 in the USA and 426 outside. Accel is the biggest shareholder with 26.7% of the stock, pre-offering. Click on the image below to blow up their recent financials. This entry was posted in BI, IPO, Social. Bookmark the permalink. Thoughtful analysis – and almost a textbook for anyone who wants to know how it’s done – a skill often missing in analyst work. Thanks for sharing! Merv’s right. I don’t much of this type of analysis because it’s a long, hard slog through a lot of information, plus it takes real insight into how a software business works. Great job. It was indeed a slog; I’m amazed how poorly structured / redundant / de-normalized these documents are, presumably by fiat, but nevertheless it makes them pretty impenetrable. The post is very timely too. I’m at the Gartner BI conference this week and I think that the data you highlighted up here will be useful to many. The financial industry would benefit a lot if they applied Alan Siegel’s work on simplification. Mostly sound analysis (I’m a sometime non-employee QV consultant). I’d be interested in more competitive analysis — especially vs. new Microsoft and other in-memory tools. A difficult tool to interop with at this point, but that could be solved. Agree re: low R&D investment, but the firm has been very productive with a small staff, proving that focus can deliver a usable product with a comparatively short implementation cycle. Good point on the cost of sales comment, QV is one of the easiest software packages to sell but unusually difficult to buy especially in US. Should be an interesting ride – If MSFT, Oracle, SAS, IBM figured out QV’s quick data assimilation to visual set analysis formula game is over for QV. Couple of things to add – The application is easy to start to use and very good prototyping tool – which explains the initial appeal and growth – but lacks IT tools for data governance, change control, etc. which limits growth. Also does not have data analysis functions, data mining, predictive modeling capabilities. Oh, and data in system is proprietary – all of this pushes down potential value and margin sustainability. From another value angle, the system and company lack domain expertise in any industry, they are experts on their product and their way of doing things which has been sufficient for the past 5 years but is unlikely to continue the next 5 years. The company and user growth number is easy to explain with their ‘free’ software license started last year. Also curious about their OEM model – which might be a solution to integrating industry and domain expertise but has not been managed that way. Thank you for such great insight. Qliktech is certainly one of the most interesting non-cloud, non-SaaS software companies to follow in the last few years (Full disclosure: I work for SAP BusinessObjects). – I am impressed by their total number of customers: 13,000. That’s significant and it leaves them with a nice recurring business if customers remain happy (which seems to be the case) and the switching costs are reasonably high. Any insight on that particular topic? – I too find unusual that they have an important indirect sales channel (+50% of licenses) yet sales and mktg costs represent close to 60% of sales. That number itself isn’t that scary and should fall over time (I believe Salesforce was in that range as well when they filed their S-1), but something doesn’t look quite right if you consider the importance of the indirect channel. – One interesting tidbit from their S-1: “(…) The expected improvements in memory capacity and CPU performance will drive QlikView’s future performance with minimal incremental investment”. The large majority of enterprise software companies take advantage of CPU performance improvements one way or the other, but the memory capacity improvement is another story – if you have a significant amount of IP around in-memory which is the case with Qliktech. That could partially explain their low r&d expense %. In other words, having already a substantial (and mature!) investment in in-memory technology, they can continue harvesting the relentless pace of memory improvments with a lesser r&d effort. Any thought? No, expect R&D to increase, not decrease. However, QlikView will certainly continue to gain from organic performance increases of processors and memory speed, but R&D is needed to design for multi-threading, data model efficiencies, and other tuning/architecture concerns. As other have said, kudos on detailed analysis. * With a reasonable 30% growth this year, revenue would be roughly $200M+ for 2010. Given record of profits, a 5X multiple would indicate $1B+ market cap. * $1B market cap with 63M shares currently issued, a target price of $15+ per share, in the normal range, is another confirming factor for market cap. * The company will get massive buzz from the usual business media outlets once the IPO is approved – as a private company it naturally has had virtually no business press coverage before. (Exceptions are a segment on Fox Business and a Forbes article sideline, both minor in length) Revenues are heavily weighted currently to Europe, given base of customers there and especially their maintenance revenues due to longer history in Europe. As QlikTech states, the bulk of expected growth is in the U.S. market. The U.S. market is decidedly more competitive than Europe for Business Intelligence for QlikView. The awareness created by the IPO could be smartly leveraged by QlikTech to launch this acceleration, which should help moderate the barriers to entry to higher growth in the U.S.
* Note the underwriters are Citi, JP Morgan, AND Morgan Stanley. Heavy hitters sharing the limelight. One could reasonably assume they’re all significant customers as part of the price of entry, which speaks well for Enterprise suitability of QlikView moving forward. Qlik’s growth in Q1 2010 vs. Q1 2009 was 66%. In Q1 2010 software license and maintenance revenue comprised 90% of the total revenue. Operating income was $M 2.0 vs. $M -6.4 in Q1 2009. All official figures in latest S-1 version (filed on May 27). A bunch of old Siebel guys get hold of some very hot technology that for years was ahead of its time, what’s not to like? What’s missing in all these analyses is that the product is not really BI; it’s best for projects where BI requires way too much overhead and Excel canNOT handle the data. Until Qlik (and now, maybe, PowerPivot) these projects just fell through the cracks. But once people realize that they can be done for relatively low cost, I think demand will increase. Why is it so hard to buy? Very intersting analysis……will they get as far as the IPO though? I was at Crystal when we were going to IPO but BOBJ acquired us soon after IPO announcement. Nice analysis and very good points, I think the introduction on the NASDAQ yesterday the 16-07-2010 also when very well and reflected the points above. Some commenst on the commenst. Qliktech offers QlikView in-cloud and SaaS modules and our OEM busienss is growing. We have done so well which low investmenst in R&D as well as only staring-up on the US market. What will happen when this increases?